Daily care to hydrate, comfort and reduce skin sensitivity. 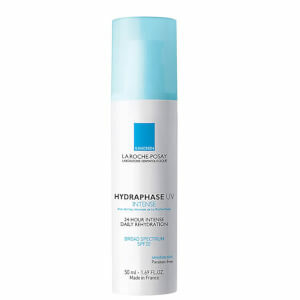 Targeted rehydration technoloy designed to: -Adapt the moisture needs of every single zone of the face. -Provide instant, intense and long-lasting hydration. It also contains La Roche-Posay Thermal Spring Water, glycerin and Sodium Hyaluronate. - Contains SPF15 and UVA protection to minimise the harmful effects of UV rays. Active Ingredients: Avobenzone 3%, Homosalate 4.7%, Octisalate 5%, Octocrylene 7%, hyaluronic acid fragments, La Roche-Posay Thermal Spring Water. Inactive Ingredients: Water, isononyl isononanoate, glycerin, dimethicone, aluminum starch octenylsuccinate, sucrose tristearate, polymethylsilsesquioxane, polysorbate 61, PEG-12 dimethicone, carbomer, triethanolamine, dimethiconol, sodium hyaluronate, sodium stearoyl glutamate, disodium EDTA, hydrolyzed hyaluronic acid, caprylyl glycol, xanthan gum, sodium benzoate, phenoxyethanol, fragrance.